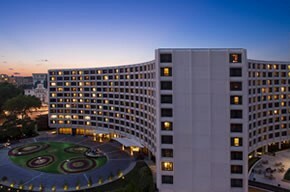 The Office of the National Coordinator for Health Information Technology (ONC) will hold the 2018 Annual Meeting November 29-30, 2018 at the Washington Hilton in Washington, DC. The 2-day meeting will gather approximately 1,200 health IT partners and will include a combination of plenaries and breakout sessions each day. The plenary sessions will include keynote addresses and panel discussions. Space is limited, so please register as soon as possible, but no later than Sunday, October 28, 2018. If you require lodging, please make your hotel reservations no later than Saturday, October 27, 2018 in order to take advantage of the special group rate. We anticipate our room block to sell out before this time, so we encourage you to make your reservation as soon as possible. We look forward to seeing you in Washington! The hotel is sold out the night of Wednesday, November 28th. Please note: Registration is only for those physically attending the meeting. Note: Visit the hotel information page to make reservations under the special conference rate.